"Fodos been living and working in Somerset for nearly thirty years. Firstly as a Planner and in Economic & Credit Union development. Then making her love for music her career by establishing herself as a Voice and Music Tutor, alongside organising local events. Her song-writing, singing and music teaching have evolved from her love of vocal & musical exploration. Passionate about everyone making music, Fodo runs music and vocal sessions for children, adults & adults with learning difficulties. Shes opened up performance opportunities to local people - running open mics and events locally - always with an eye on gender and age balance. All the while shes retained an interest in social infrastructure and supported local actions. For three years she was on the board of the local Credit Union. Shes privately offered planning advice and delivered successful planning applications for people in rural areas. 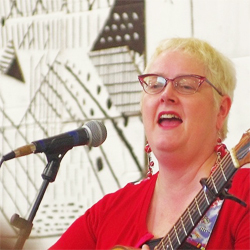 For Fodo womens equality is a goal and to that end shes established a fledgling local group promoting Women Making Music and has her own project remembering songs of protest by women. Fodo also performs and has her own PA equipment. Much of her work is paid for by the customer but she also fundraises in order to offer music sessions more widely.